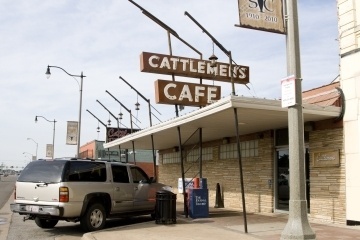 More cheap eats to whet your appetite! The breakfast at our hotel in Singapore was nothing much to speak of. Some toast, jam, and a piece of fruit. So the next morning we felt we should get out and learn what a real Singaporean breakfast would be like. 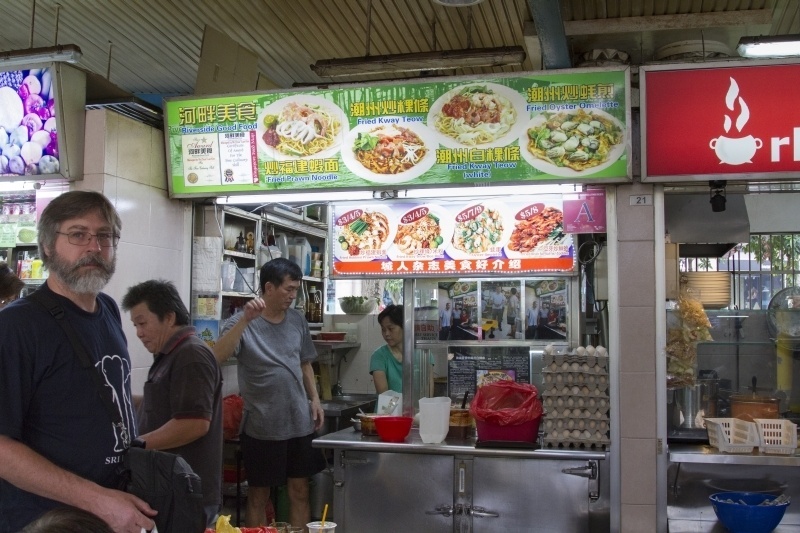 One of the food centers that kept coming up in our searches as being the most local and authentic was Tiong Bahru. A quick consultation with the map, and the by now indispensable app, Pocket Singapore, and we were bustling along down the road on another bus journey. Tiong Bahru is a quiet neighborhood tucked away into a corner of the city with art deco style buildings, plenty of green spaces, and a 1950s era market hall and food center. Walking in to the food center at around 8:00 in the morning we found a bustling, lively crowd enjoying their breakfasts, chatting with friends, doing tai chi, or simply sitting and enjoying a quiet cup of kopi. The food center here is smaller than others so it took little time to walk around and survey the different offerings. The more popular choices on this rain washed morning were half-boiled eggs, roast duck, carrot cakes, or noodles. To me, the carrot cake was an intriguing option. It is nothing like what westerners would think of for carrot cake. This is a savory dish with tofu, carrot, eggs, and other vegetables I couldn’t quite put my finger on. The whole mass is fried up with a black sauce (if preferred) and served hot on top of a banana leaf. I went with the black carrot cake instead of the white, simply because that is what the cook told me was his favorite style. Devon and Corinne were feeling egg deprived so they were excited to see many people eating soft boiled eggs. We found the stall that was doing the best business for them and asked about the $2.80 breakfast set. In a confusing two or three word conversation we were no closer to finding out what was in the set but we were getting two of them, whatever it was. It turned out to be two half-boiled eggs, kaya toast, and a cup of kopi (sweetened with condensed milk). The eggs were served in a small plastic pitcher filled with boiling hot water. At the table, Corinne pulled out an egg and cracked it open only to have a hot raw egg plop onto her plate. Oops! We figured out too late that you need to wait a good ten minutes to let the egg cook! The next eggs were done perfectly with just a little bit of patience, and we rounded out the meal with a tenderly cooked roasted Cantonese duck over rice. As far as typical breakfasts go, I could definitely be happy with this fare. The last food center we went to might just be my favorite. I could eat here every day! Walking out of the MRT was like stepping right into a crowded street in Delhi. The sights, sounds and smells gave the location away immediately. This was Little India. We followed our noses directly to Tekka Center food stalls and wet market. Right away as we walked in to the food center Corinne saw a small family dipping in to a beautiful bowl of golden, butter chicken. Never the shy one, “Where do I get that?” she asked. The little boy practically dragged her, smiling all the while, to Par Kashmini where we directly ordered butter chicken, aloo gobi and 3 naan. There was no question despite the over 30 other stalls to choose from (they would have to wait for another day, another visit). Devon went off for lime juice and I went in search of masala chai while Corky held down a coveted table. I had to wait at the grimy chai stand for the order ahead of me: six masala chai to go. After the 3 foot pour from pot to cup the chai man poured the chai directly into little plastic baggies for the takeaway! Back at the table waiting for our food, the little boy had finished his meal and came over very apologetically, “It maybe will take a while.” He had gone and checked on our order and wanted to make sure they were taking care of us! Too cute! The order arrived and we quickly realized this was not the golden, butter chicken we had ordered but instead was lamb curry. This was quickly sorted out, and we were soon devouring the spicy, delicious food. Singapore may be one of best cities on Earth for finding any type of food that you want to have. According to their latest report, there are over 6,000 places to buy food. There are about 2,421 restaurants, 438 fast food outlets, and 3,455 other types of eateries in a 697 sq. km. area (slightly smaller than New York City). You could easily spend your entire trip in Singapore and never have anything other than what you are used to at home, wherever that is. We saw restaurants that specialized in Sumatran, Finnish, Ethiopian, Mexican, Italian, French, American, Turkish, and of course lots of Asian foods like Chinese, Thai, Japanese, and Korean. The amount of choices were amazing! Have you been to Singapore? What did you think of all the eating options? 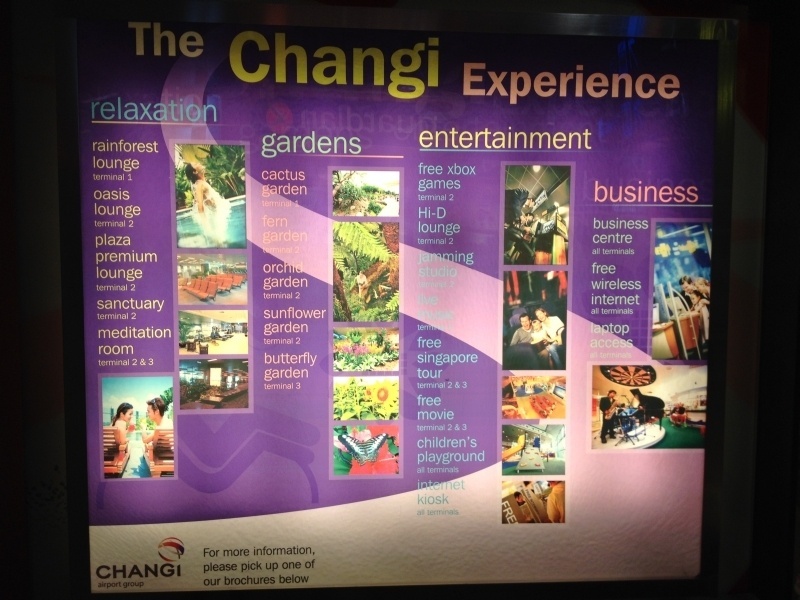 Singapore Airport and Why It’s So Awesome! Janice You definitely could spend all your time on food in Singapore, it’s that good! But, there are many other things to do as well. I love Bali. Are you staying in Ubud? 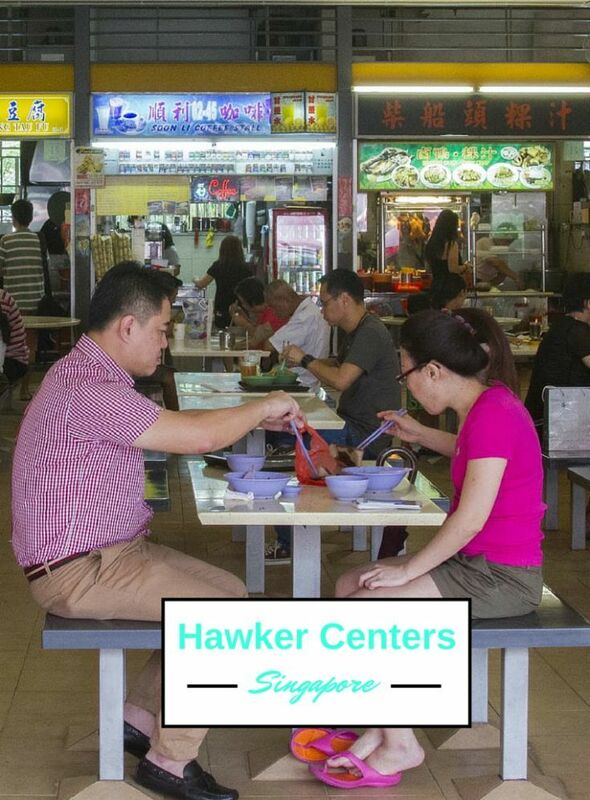 Maxwell Hawker Center was our favourite one. 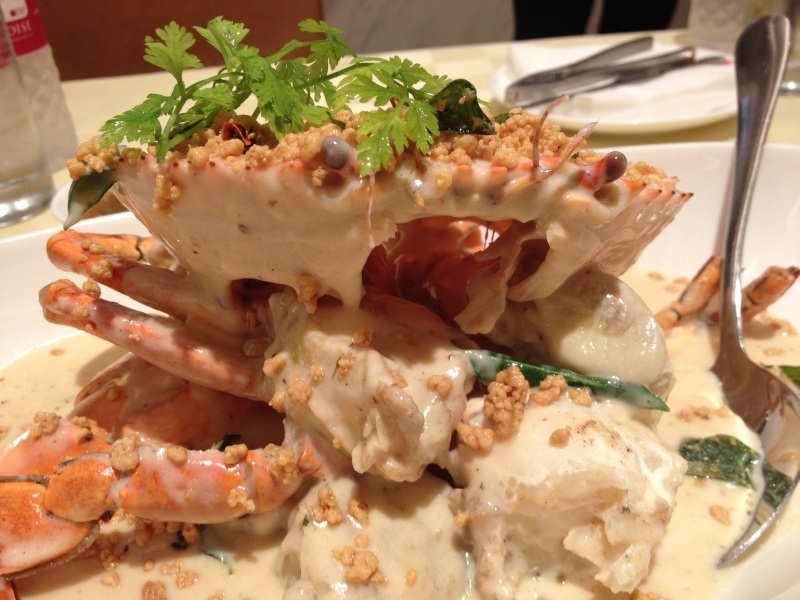 It’s incredible that you can still eat on the cheap in such an expensive place as Singapore. My favourite meal was fish soup and roti prata! Agness The three of us still have dreams of the roti prata! So good! Mike, We did end up ordering half-cooked eggs again, and after letting them sit for a few minutes they were delicious! Ben, Have you been to Singapore? Eaten at a hawker stall? So good! C'mon and Join the A-Z Blogging Challenge with Me!